New Pocket Bear - Mittens! 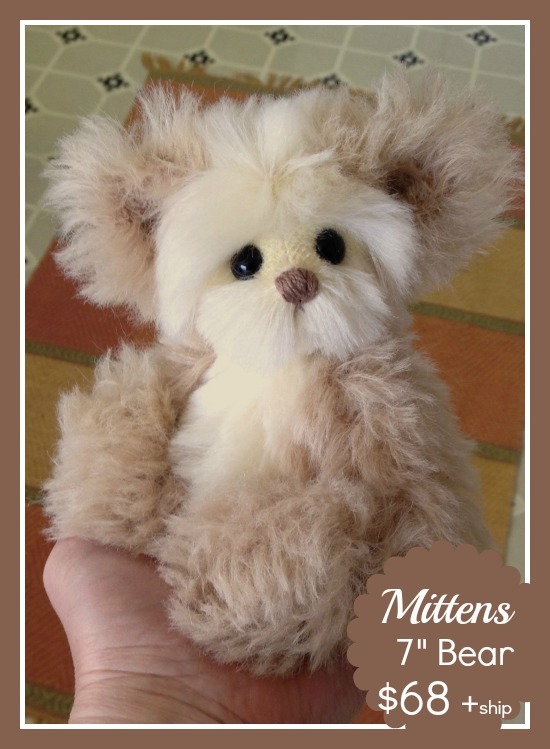 Please meet Mittens - the first Pocket Bear of 2017. Mittens is about 7" tall and was created out of two colors of lovely soft alpaca: a very light ivory color and a light tan. He has shiny black glass eyes and a tan hand stitched nose. Like all of my Pocket Bears, he is fully disc and pin jointed, but does not have any paw pads. His face has been carefully scissor sculpted to bring out his personality. He has been filled with lots of hugs, and also fiberfill and stainless steel pellets for a nice hefty feel. 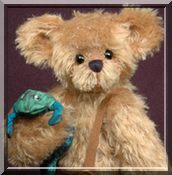 I'd like you to meet Little Rosalie, the latest little miniature bear that has been born here in the studio. She CAN stand all by herself and is 3 1/2" tall, 2 3/4" sitting. She is available for a limited time (until Wednesday) for a discounted price of $79 + shipping. After that she will be listed on the website at the full adoption fee of $95 +shipping. She was created out of pink and white alpaca with soft white foot pads. She has hand made black glass eyes, a hand stitched black nose and a scissor sculpted face. She is fully disc and cotter pin jointed and is filled with tiny stainless steel shot and premium fiberfill.